Southampton, PA. –CW Industries, a long recognized manufacturer of switches, connectors and custom components for the OEM, is pleased to introduce the GIL-2000 Series indicator lights that are designed to snap fit into a 1.125in.X .550in. rectangular panel opening with no hardware or tools required. Standard lens colors are red, amber, or green and are rated for 14V, 28V, 125V applications. The standard actuator is made of UL94V2 polycarbonate and the housing is made of black nylon. These indicator lights are compact, lightweight and extremely rugged with an operating temperature range of -40o C to +105oC. 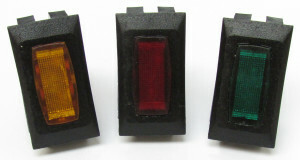 The GIL 2000 Series indicators are styled to match the CW 2000 series full size rocker switches. Lead free and RoHS compliant, the indicator lights are highly reliable and ideal for power, status and warning indication across many industries including the transportation, medical, process control, utility and RV markets. Custom colors and options are available. Serving customers since 1904, CW Industries is a vertically integrated design and manufacturing company serving many of the leading industrial, consumer and defense electronics manufacturers with complex electromechanical slide, rocker and pushbutton switches; insulation displacement and MIL SPEC connectors; and a variety of custom switches, custom connectors and assemblies that require a high level of precision, performance and reliability. Our in-house capabilities include molding, plating, stamping, tooling, CNC machining, welding, assembly and metal finishing. CW’s Build to Print Work Cells and Contract Manufacturing Business Unit supports a wide range of applications in the Aerospace, Defense and Medical industries. CW is ITAR Registered, IS0 9001 Certified and our in house environmental and chamber test facility is qualified to UL, CSA and DOD standards. For more information and technical specifications, contact CW Industries, 130 James Way, Southampton PA, 18966. Web: www.cwind.com. Phone: 215-355-7080. Email: sales@cwind.com. This entry was posted in CW Products News. Bookmark the permalink.